This Thurston County, Washington farm has served to recharge me from a demanding career. 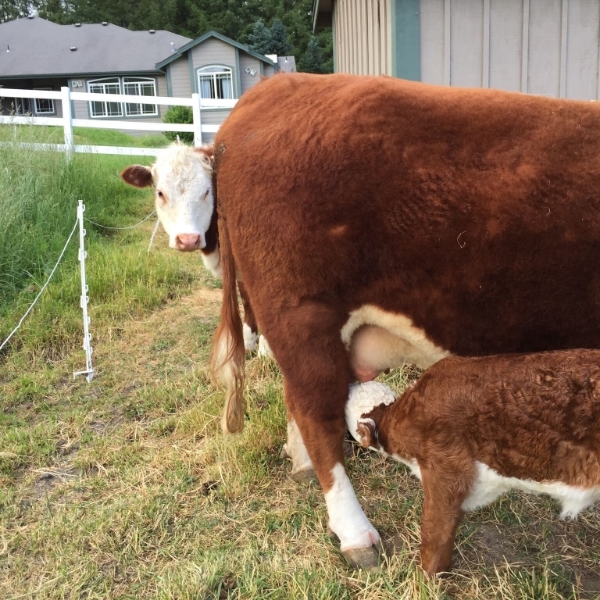 I work to raise seed stock Herefords cattle that pose desirable genetic traits that can be measured by DNA testing and expected progeny difference( EPD’s), which is based on ancestry. 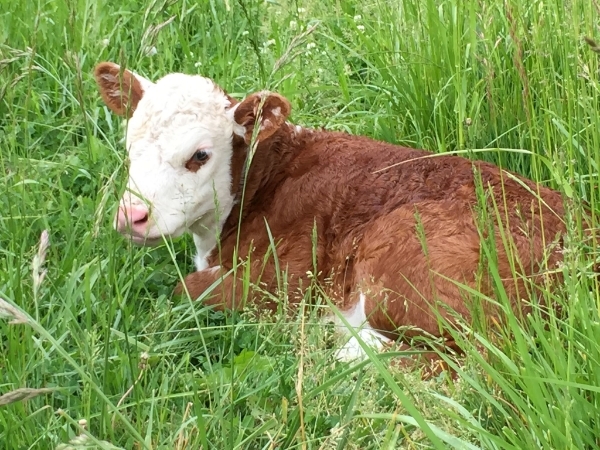 It is fun to choose from the array of Hereford bulls with leading genetics and then see how the offspring turn out. Working to be a good steward of the land and my animals has taught me a lot, from carpentry skills and rumen function, to dung beetles and native pollinators. 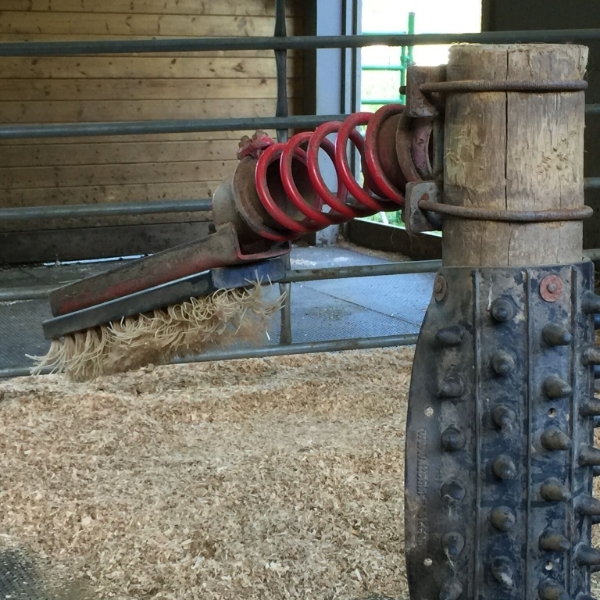 Horses for Clean Water got me launched into best practices with their great practical information, especially dealing with the rain and manure issues that come with raising livestock in the Pacific Northwest. The farm has evolved over time to encompass a number of best practices. 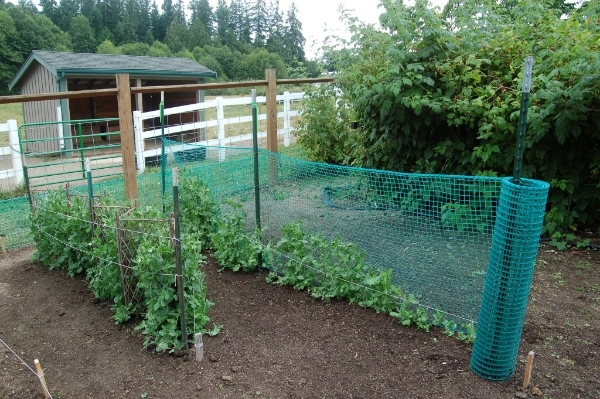 Constructed a winter confinement area that is free of mud. Manure is collected daily. Cattle hay is weighed with a scale obtained from a restaurant supply company. The corded digital readout is separate from the scale making reading it easier. Hay is placed in a dedicated garbage can to weigh it (pictured). Constructed a manure composting building that is conveniently located near the winter confinement area for chore efficiency. I use piped in forced air and the tractor to to turn the manure which both augment the rate of decomposition. 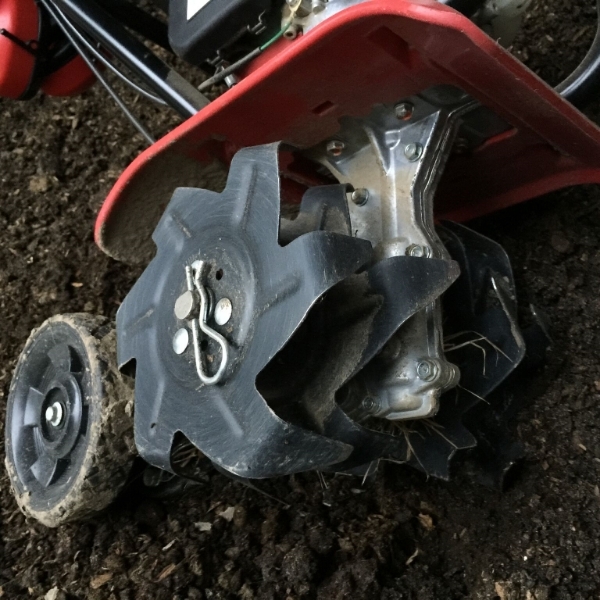 I also use a lightweight rototiller to break the drier composting cow manure into smaller pieces, to augment the process further (pictured). Not any tiller will do the job. Look for a smaller tiller with tine fingers that are bent at a 90 degree angle as these are. Many of the smaller tillers have only slightly curving tine fingers that don’t do a good job. They are more of a cultivator. Often I have paid people who have done some small job for me with this organic compost at their request. Installed gutters on all the buildings which relocates the water away from animal areas. The downspouts are covered in schedule 40 plastic pipe for protection from crushing. I have found that tight lining the water to a surface area, not a dry well, requires the least amount of maintenance. 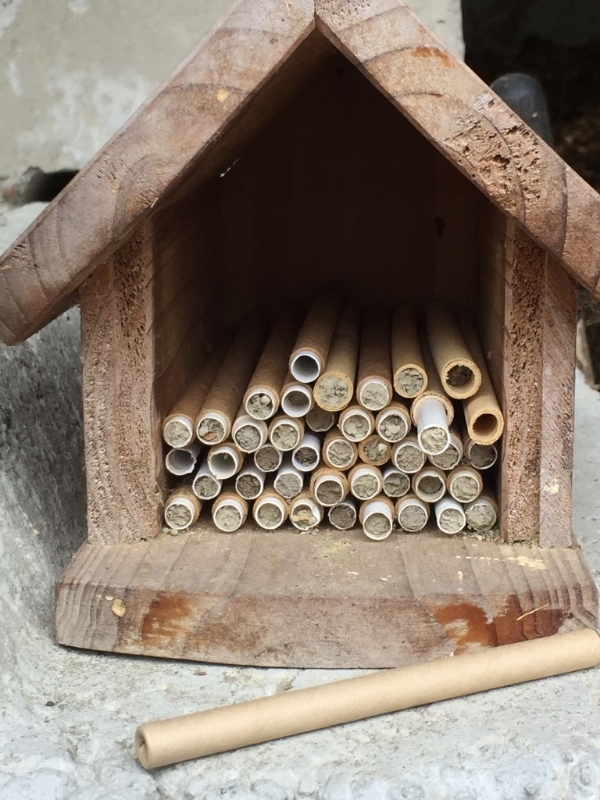 In the spring these wet areas serve as a source of mud for the Mason Bees as they build their nests (pictured). Installed lighting in and on most of the outdoor animal shelters. This works great for the short days of winter. I have moved away from sodium and mercury vapor dusk to dawn security lights to LED models. It seems like the ballasts in the older two methods would go out every 3-4 years, and climbing up on the ladder to the peak of the building to change the bulbs is a bit scary. The LED lights use less energy, give off a great white light and are supposed to last longer. Constructed a cement apron in front of the cattle loafing shed that is topped with rubber mats. This keeps the heavily traveled area mud free in the fall before the animals go to the winter confinement area. Rubber mats placed on concrete are held in place with pavers set in the concrete at the seams. When pouring the concrete, the mat seams need to be mapped out in advance so you know where to set the pavers in the wet concrete (pictured). Rubber mats may need to be cut around the stall posts and pavers. To make the job considerably easier, heat up the razor blade on a cutting tool with a self-lighting gas torch tool. The hot knife will cut through the rubber much easier, saving you a lot of time and effort. Discard the blade after use. The job goes faster and easier with two people and two razor knives, one to cut and one to heat up the blades. Exercise caution with the open flame. Use both pasture rotation and strip grazing via portable electric fencing that works to maintain a healthy grass cover. This is done with the original white O’Brien Treadaline step in posts and electric poly wire. I have found this brand (the original white ones, not the blue ones) of step in posts to have the most durability and they are easy to step into the ground. Polywire runs are connected to each other by alligator clips to transmit the charge of electricity from one polywire run to another. 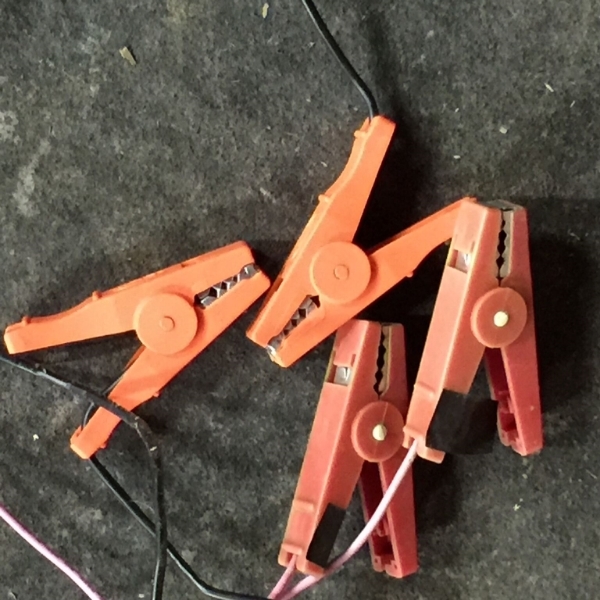 Two different brands of alligator clips used to transfer electricity from one run of polywire to another (pictured). These clips are invaluable for quickly moving electrical fence lines. By setting the electrically charged polywires high, calves can pass underneath and graze the best grasses with the cows to follow when the fence line is moved (pictured). Most cattle people will tell you they are really grass framers. I add nutrients to pastures as needed. It seems liming is always necessary. Dung beetles break up the manure enough such that I have not used my harrow for a few years now. I stay away from worming medication and fly control methods that could hurt the dung beetles. I over seed in the fall areas that show excess wear. Pathways are a great place to over seed before the cattle are moved out, as the cattle hoofs work the seed into the ground. Other areas will need the grass seed to be covered. Composted manure may help with this step. Flies are controlled with wasp predators and Rescue brand fly attractant bag traps. I also use a fly spray for the horn flies. Different types of flies are killed or trapped by different methods. The trick is to have a method for each type of fly that is on your farm. There is not one type that gets all flies. I also install about a dozen bird houses that are filled with mostly tree swallows. Beware of hanging fly sticky tape in your barns that can trap and kill bats or barn swallows. I have installed a number of scratching devices for the cattle in the various loafing buildings. They use them regularly, and I believe it provides some comfort and recreation during the winter confinement. The least expensive scratching device to install is screwing a two foot broom brush (the end that sweeps the floor) to a post. The brush needs to be cleaned during shedding time as hair builds up and it is no longer effective. Another item I use is a purchased rubber device with protruding fingers that mounts to a wall or post. I have found the rubber purchased devise is very durable and easy to install but is on the expensive side. I use large washers with the screws to better hold the piece, which I believe it adds longevity to the device (pictured). Barn security and safety is gained with locking devices that sink into the concrete and hold the doors shut when needed. They are available at most hardware stores (pictured). Use a concrete drill bit to make the appropriate hole size. Fire extinguishers are located in the barns as well as outside, for easy access should an outside fire occur. Installed native and other pollinator plants that provide nectar and pollen for when the bees first emerge (heath/heather, witch hazel, & hellebore) along with plants for springtime (flowering current, rhododendrons, heath/heather, & grape hyacinth/mascari) and plants for summer and fall (raspberries, native black berries, strawberries, wild cherry trees and domestic flowers). It is important to provide food for the whole life cycle of the bee. Native plants require the least maintenance, but do require watering the first summer planted. I purchase mine at Conservation District and Native Plant Society sales. I like to purchase and plant in the fall so the rains will give the plant a chance to set good roots. If you purchase plants in the early spring, consider putting them in containers for the summer and plant them in the fall if you do not want to have bring water to them all summer long. This is a time saver when watering - the pots can be located in just two locations (a shady and sunny one, depending on a plant’s needs). I have recently been awarded a Pollinator Habitat Enhancement Grant from The Natural Resources Conservation Service, part of The US Department of Agriculture. If you are interested in learning more, talk to your local NRCS office or visit their website. I have also enhanced the property for wildlife by providing water sources and shelter locations for a variety of animals. The snakes have rock warming areas and hibernate under the concrete patio. The birds have berry bushes such as elderberry and cherry trees, along with forested areas to feed and nest. The rough skin newts have logs and other woody debris in the forest to utilize. The list goes on … realize you may not always want what you attract, for example possums, who consume the eggs of tree nesting birds. One year I had a honey bee swarm set up housekeeping in an irrigation control box. I have tried a butterfly house but have had no takers. The bats have ignored the bat house and gone for the nearby space under the barn door wheel track housing. This year I am going to try a moist mineral container for butterflies. You can read more about attracting butterflies at Gardening with the Helpful Gardener.